Hagios Charalambos is a secondary burial cave with artifacts ranging in date from the Final Neolithic to Middlle Minoan llB, with a small number of finds from later in the Bronze Age. Its material culture indicates that the community which buried its dead here came from nearby,because a large majority of the pottery is manufactured from the local red clay fabrics used in Lasithi and in the adjoining Pediada. The bones were all moved to the cave during Middle Minoan llB. The 2003 season at Hagios Charalambos resulted in several new discoveries at the site.First excavated in 1976,the small burial cave in the Lasithi Plain was a focus of a new project undertaken as a collaboration between Philip Betancourt and Costis Davaras. 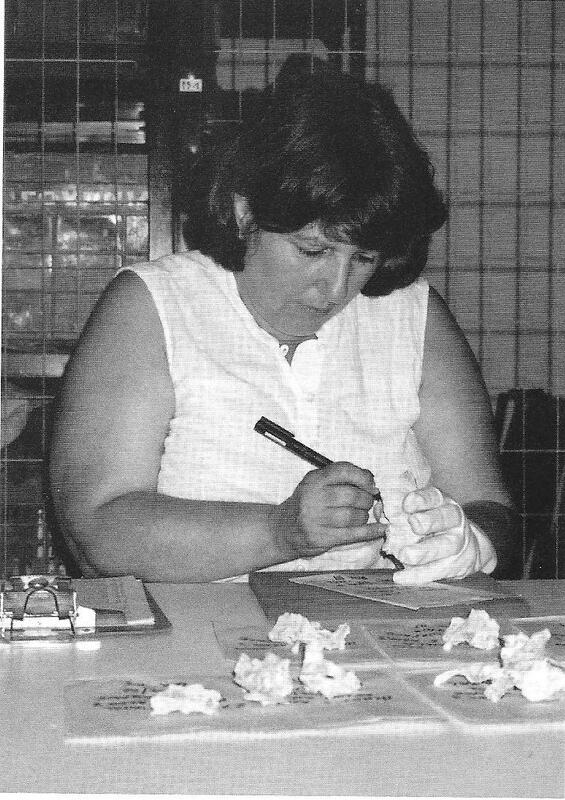 For the 2003 season, Eleni Stravopodi joined the collaboration representing the Ephoria of Spedeology. Jamed D. Muhly and Albert Leonard.Jr were field directors. The Excavation uses the Instap Study Center as its headquarters. Important new finds came from the 2003 season. Among the most interesting are two ivory female figurines used as pendants,an ivory monkey figurine also pierced for suspension,beads of rock crystal, serpentinite,and other stones, a bulls head pendant, a fragment of ostrich eggshell,stone vases, a prism seal with a design of three human figures, and both whole and fragmentary clay vases. The ivory figurines are especially important because they help show that the site was receiving either foreign raw materials or the objects made from them. The ivory is all from the teeth of the hippopotamus, a material that is more common than elephant ivory at the beginning of the second millennium b.c. in Crete. The style of the figurines is Minoan. The prism seal belongs to a class manufactured at Malia in MM lB-llB Its three sides each have a different motif: a group of three human figures; a horned animal,probably a goat; and an abstract design. The tiny piece of ostrich eggshell is the first piece known from the Lasithi Plain. It was discovered by sorting the soil retained for water sieving. This excavation saved l00% of its soil because soil from tombs contains many tiny human bones as well as other objects. Sorting it with water separation machine saves all the bones of pre-natals,infants and sub -adults, which are difficult to collect by conventional excavation techniques but are essential for conclusions on infant mortality rates and for other studies concerning children.The piece of shell , gives us proof that such objects were not only imported into the island of Crete but were also distributed to inland sites, is an added bonus that was also collected this way. 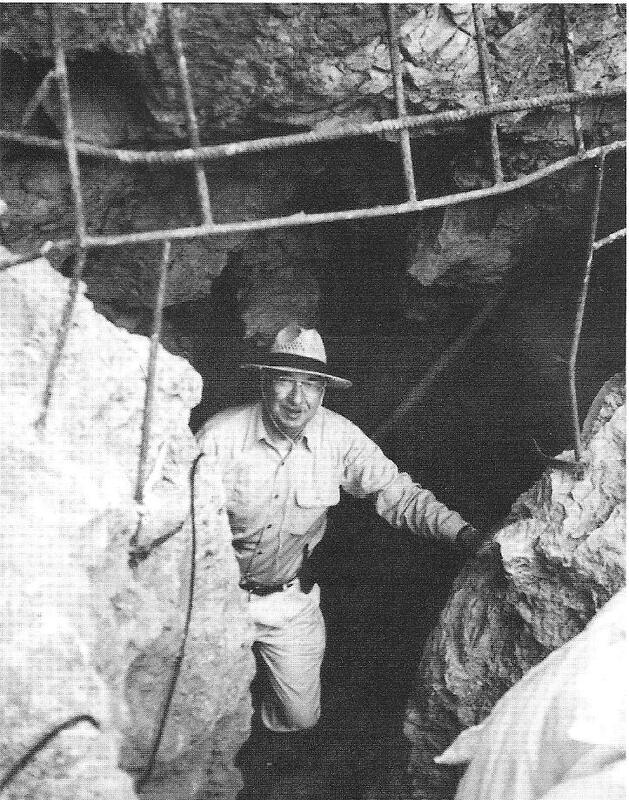 Philip Betancourt at the modern entrance to the cave. Good evidence for ritual feasting came from excavation just outside the mouth of the cave.When the bones were deposited in the Middle Minoan period, a ceremony outside the cave left many bones of food animals with butcher marks on them as well as a considerable number of tiny pieces of charcoal from the cooking fires.Among the animals were cattle and pig as well as sheep or goat, a testament to the stock raising that seems to have been an important part of the economy in this high,fertile plain. 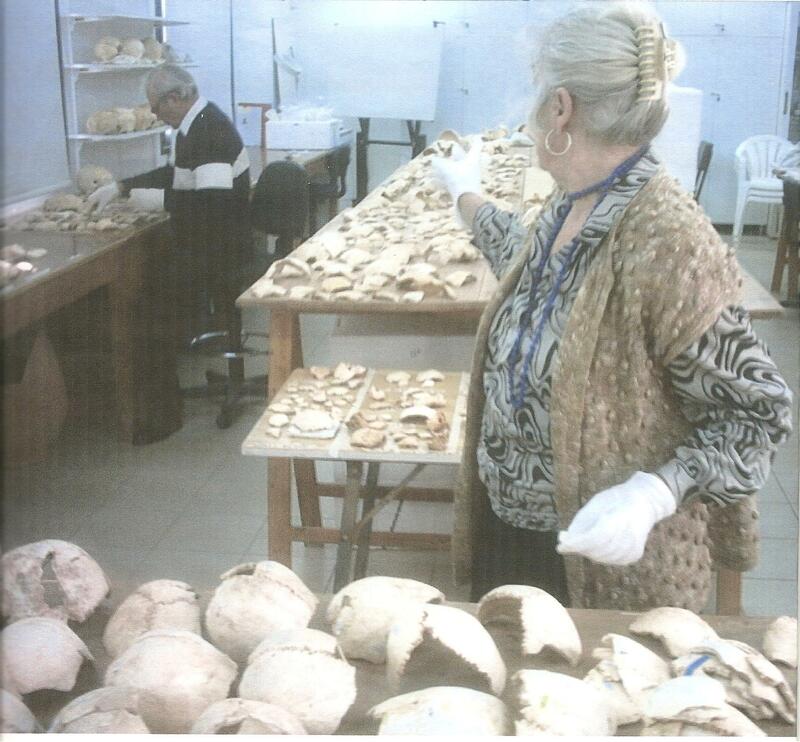 When the study of the human bones from the Hagios Charalambos cave burial began at the Instap Study Centre, John and I were asked if we would like to help with sorting all the fragmentary pieces of bone as well as skull bones which needed to be joined. There were literally thousands of these bones to be worked on and for us it was a new experience,I had worked on a small project of bones before but my main interest lies with ancient pottery so both John and I were really looking forward to this project from such an importent excavation site. 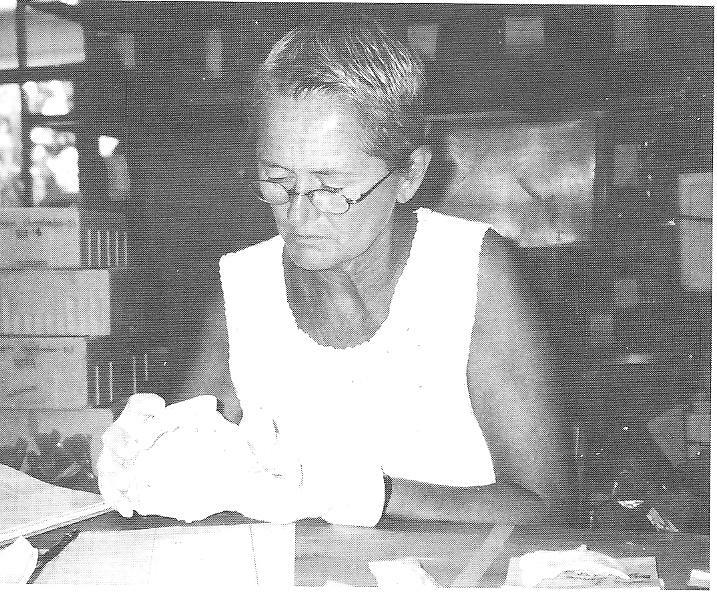 Jane Hickman studies a partial skull from the cave. 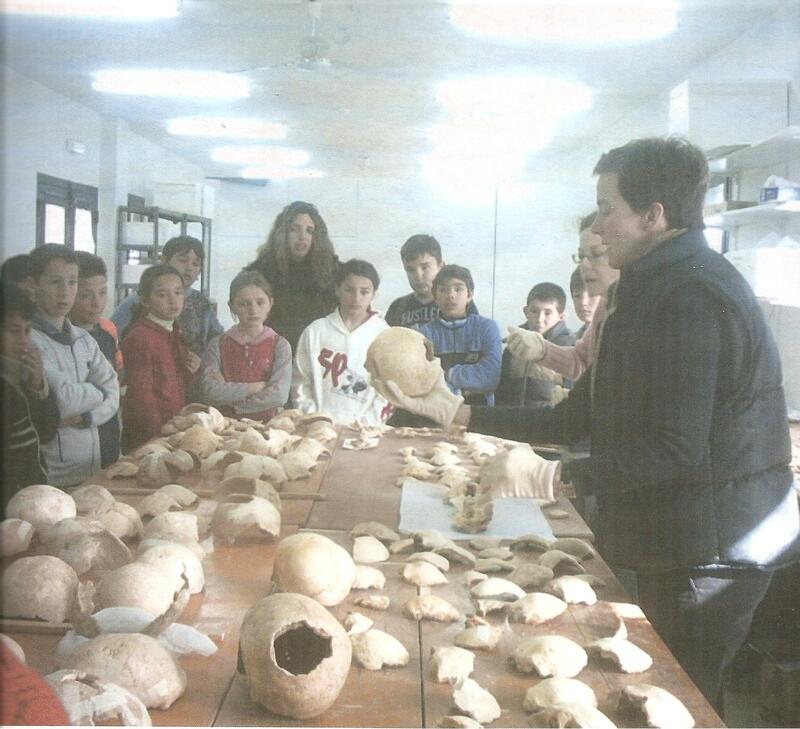 Etienne Baxter talks to school children visiting the centre about the skulls. It has been sometime since two of our dear friends Gracia and Pete came to spend a holiday with us, not only to visit but to track down and photograph the Rock Rose of Crete in its natural habitat.The Rock Rose produces Labdanum,an aromatic substance sometimes used in incense and perfume. Gracia and Pete trade in incense resins sometimes travelling to far off countries to obtain many of these exotic items such as frank’ incense and gods smile. They took their wonderful aroma’s and sold them at the Re-enactors markets where we met them many years ago, We were then trading as Apicius Sauces made from original roman recipes. While Gracia and Pete were holidaying with us in 2006 they visited the Agios Nikolaos museum in Crete where to their amazement they observed more incense burners than they had ever seen in a single exhibition.They were intrigued by the fact there were some very unusual burners they had not come across before. We suggested that they bring this to the attention of Thomas Brogan,the Director at Instap Study Center where we work.The reason for our suggesstion was because during sorting of pottery we occasionally come across sherds with holes in them. We thought maybe these sherds could be from one of the incense burners such as those Gragia and Pete had observed in the museum. Our director advised them to have some replica burners made,and then simply try them out. He also recommended that when they return to Crete they liaise with achaeochemist,Andrew Koh and put together an experimental archaeology project. 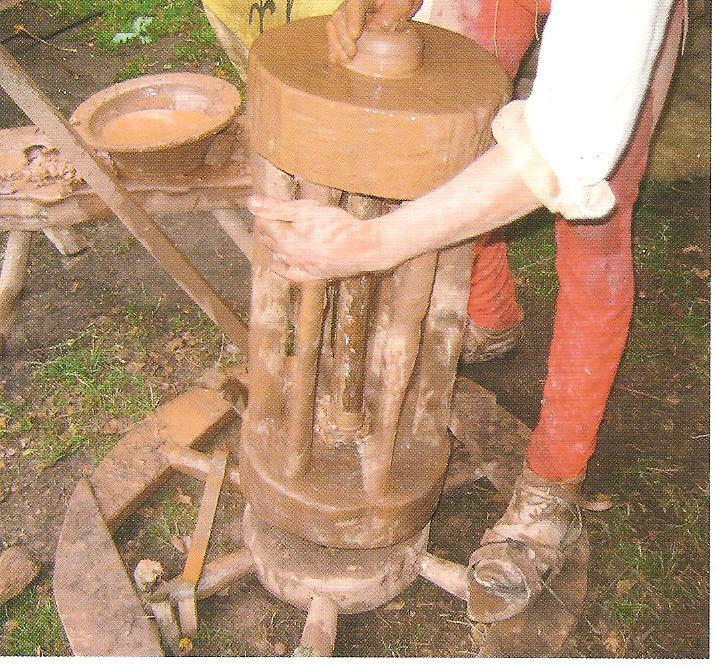 Jim Newboult another of our re-enactor friends specializes in making replica’s of historic and prehistoric pottery, produced replica’s of three designs using both a hand turned slow wheel to shape a clay type matched to the original artifacts. 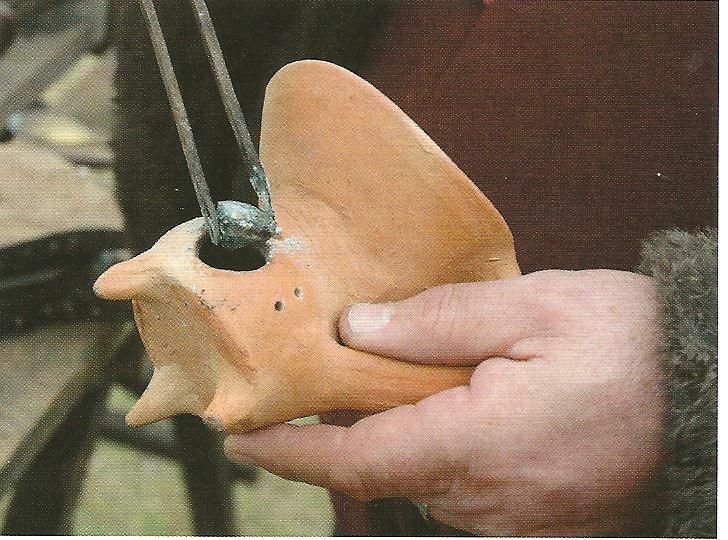 Jim Newboult makes a replica of a Minoan incense burner. Gracia and Pete returned to Crete a few weeks later to meet Andrew,bringing with them examples of some resins they believed would have been available in Bronze age Crete delighting Tom and us all at the centre with amazing aromas of natural incense. This brought back many memories for John and I when on our reenactment stalls, the intoxicating smells from Pete and Gracia’s incense spread throughout the camp. Firstly,the type A burner is a curious shape consisting of a saucer with a dome in the middle.Sometimes this dome is perforated. 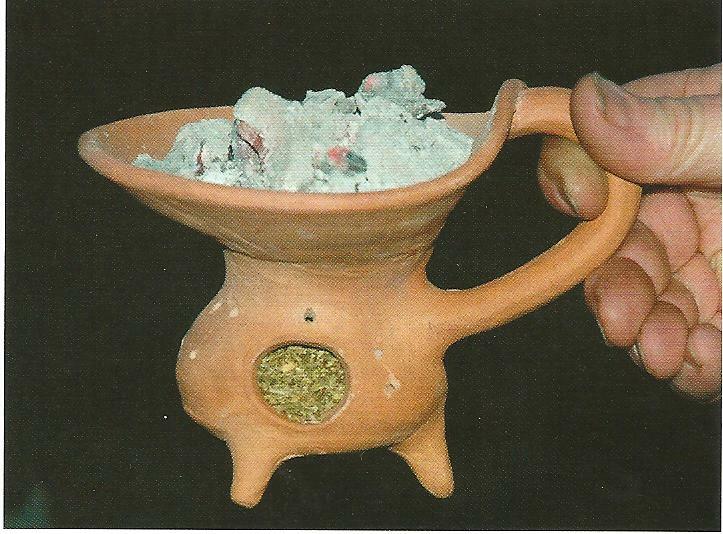 The replica was based on a Late Minoan lB artifacts from the Agios Nikolas Museum.The obvious method of usage was to put lighted charcoal into the cavity, unfortunately this was a failure,as not enough heat could be generated to vaporize anything, even with the use of bellows! 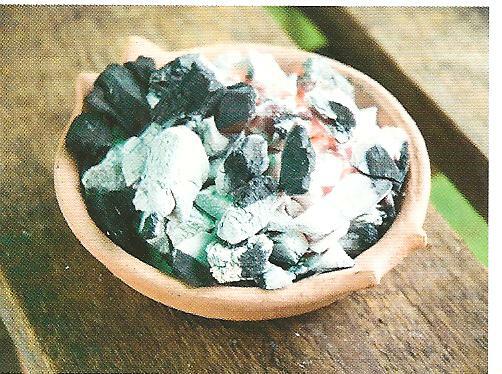 When the bowl was filled to the rim with burning charcoal,however,the charcoal remained hot enough to vaporize frerana resin for about two hours. Replica of a type A. 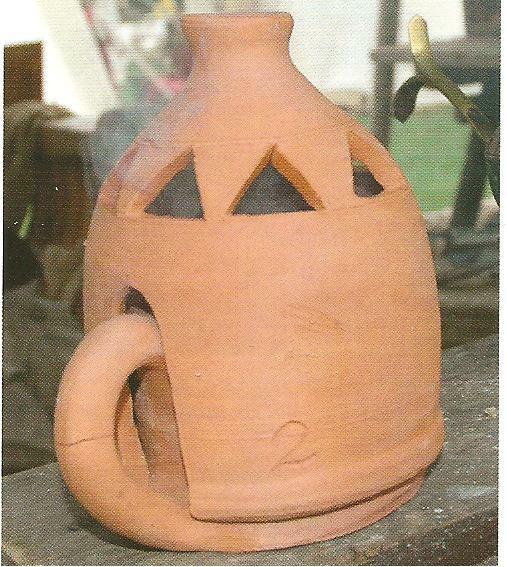 Fig 3 incense burner filled with burning charcoal. Furthur airflow increased the temperature of the coals considerably, and as a result windy conditions instantly ignited the resin. It was found there was no need to use bellows,as the perforated inner dome appeared to amplify the air flow to the charcoal but the base of the burner became to hot to hold,and managed in windy conditions to scorch the wooden surface on which it was resting. It was decided there must be a way to carry the lit burner and it was soon found that a small basket of willow proved to be the ideal solution and a burner was filled with hot charcoal and placed in the basket. Replica type A. 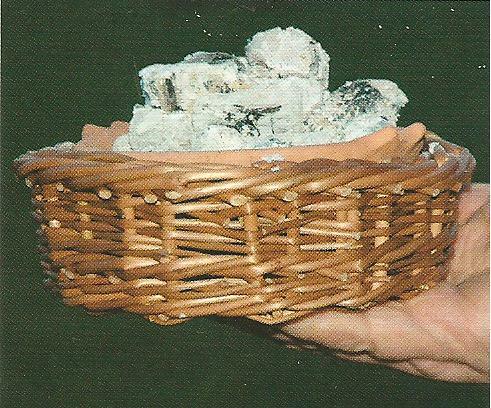 Fig 4 incense burner filled with burning charcoal placed in a basket. The team soon noticed that they could hold the basket quite comfortably,and when indoors,the willow was only slightly scorched. 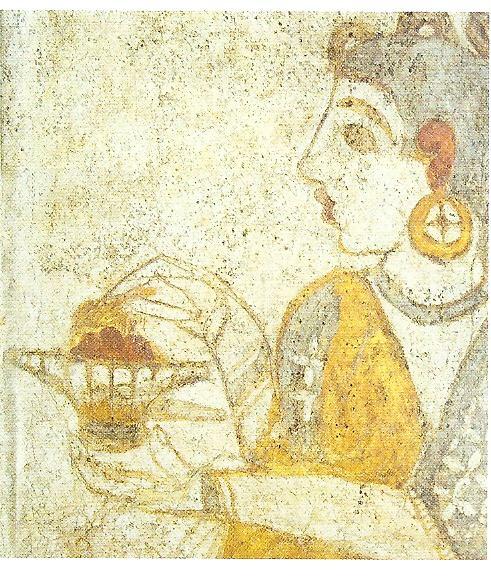 Interestingly,this combination of basket and burner resembles the incense burner held by the “Young Priestess” in a wall painting in the West House at Akrortiri,Thera. Replica of Type B. Fig 6. incense burner. Apparently, the perforated lid slows down the airflow to the charcoal.Although the base certainly becomes very hot,the unit was very easily moved around by the handle.This characteristic of the burner led to the belief that it could have been used for another purpose, therefor it was thought that given the precious and sacred nature of fire in the Bronze Age these recepticles could have been designed to retain fire while it was carried from room to room or from house to house. If used for this purpose,the lid would have acted as a guard or “cur-few” (literally ‘cover fire’), thus preventing materials from falling into the vessel and catching fire. This question could be answered by residue analysis of deposits on the inside of the lids. Initial tests were carried out on a single burner. In order to replicate residue deposits the remaining four burners were employed.Each was filled with charcoal,and over a period of two hours,a different type of incense was burned in each burner. Fig 7 Testing the Type B burners. The main two resins used for all the experiments were types which would have been readily available to the Minoans; Labdanum(Citus species),which grows on Crete,and Mastic(Pistacia lentcus) a plant which now comes from Chios but is known to have grown on Santorini(Friedrich 1978, 109-128. Both vaporize at a relatively low temperature. Mastic is similar, if not identical, to the” terebinth” found on the Uluburun ship wreck and identfied at Tel Amana in Egypt (Serpico and White 2000a and b). Furthemore, Andrew Koh has already discovered traces of labdanum on some Minoan artifacts. The other two incenses used for this experience were black storax and Coptic Frankincense.Black storax is a mixture of the charcoaled bark and resin from Liquidamber orientalis which comes from the Levant(nowadays mainly modern Turkey). The potential use of Copice Frankincense(Boswellia frerana) during the Bronze Age is debatable. Although Gracia and Pete believe it comes from Somalia, and that the potential trade routes to the eastern coasts of Africa would have been easier than those needed to obtain the Arabian Frankincense (B.sacra). 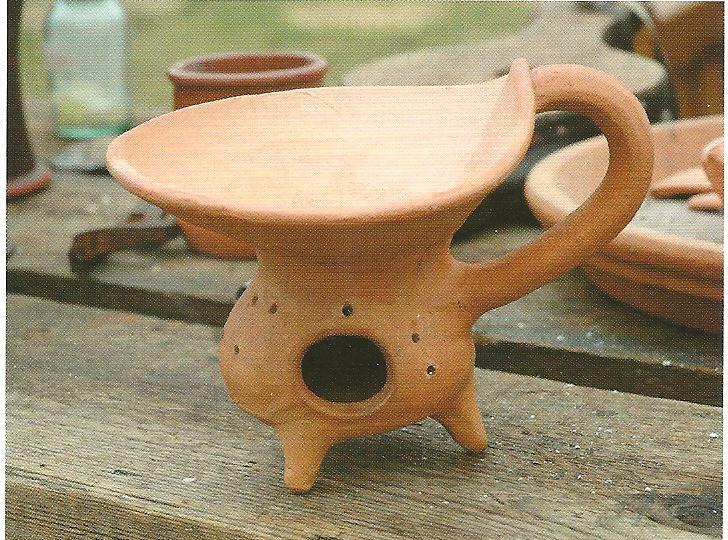 The replica Fig 8 burner was based on a late Minoan lB artifact from the Makryialos Minoan villa(the same provenance as type A This burner was the item that had originally caught Gracia and Pete’ attention,and as they initially predicted,burning charcoal in the lower cavity failed to achieve anything more than a melted resin (Fig 9). Even so, one extraordinary result was obtained. If one fills the top bowl with burning charcoal,enough heat radiates downwards to release the aromas from resins placed in the lower cavity (Fig l0). However once again residue analysis would be needed to give a better understanding of how this item was employed. 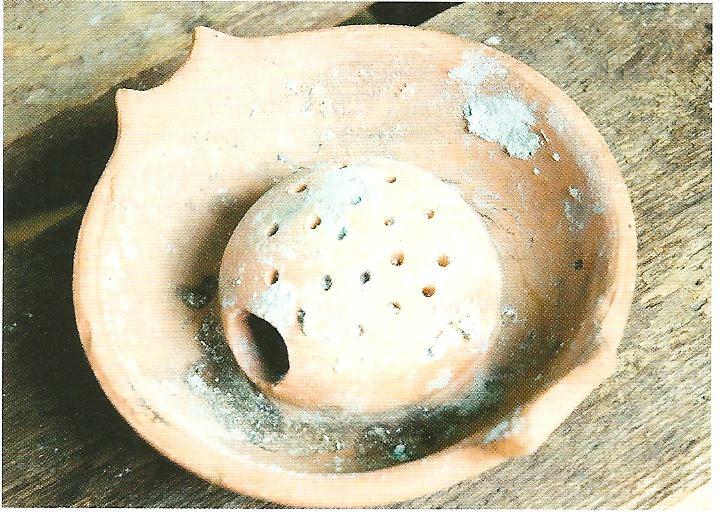 Fig 8 Replica of a Type C incense burner. of the replica of a Type C incense burner. Fig 10 The top bowl of the Type C replica is filled with burning charcoal. Bringing these ancient artifacts back to life was a fascinating challenge for Gracia and Pete least of all an exciting experience for us all at Instap Study Centre. Hopefully these experiments will help to build a working hypothesis on the functionality of Minoan incense burners. At this point all the replicas have now been given to the Study Center for further analysis and comparison.If we have used these replicas in the correct manner then our own burners should posess residue deposits which would correspond with those on the original artifacts.But if this does not occur then further experiments will need to be tried. With this last comment Gracia and Pete bid us all farewell promising to visit us again soon.